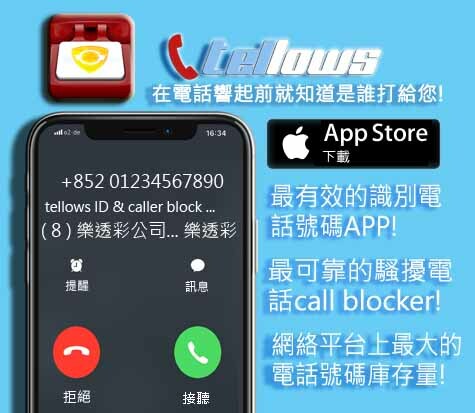 This entry was posted in tellows基本相關說明, tellows基本相關說明 (香港繁體) and tagged call blocker, heapmap, Phone Spam, tellows, tellows heatmap, tellows屏蔽電話, tellows香港, 垃圾電話, 屏蔽電話, 推銷電話, 熱圖, 詐騙電話 on Monday February 25th, 2019 by tellows.de Team. This entry was posted in 本週最煩人的三通來電 and tagged Tellows來電統計, 廣告電話, 推銷電話, 最煩的來電, 騷擾電話 on Wednesday March 13th, 2013 by h.hsieh. This entry was posted in 本週最烦人的三通来电 and tagged Tellows来电统计, 广告电话, 骗子电话, 骚扰电话 on Monday March 11th, 2013 by h.hsieh. This entry was posted in 0900 on Friday March 8th, 2013 by h.hsieh. (中文) (中国骗子电话新讯) “包裹未领”? 小心假冒邮局的骗子电话和短信 ! This entry was posted in Tellows 骗子电话新讯(中国) and tagged Tellows 骗子电话新讯, 骗子电话 on Thursday February 28th, 2013 by h.hsieh. This entry was posted in 本週最煩人的三通來電 and tagged 廣告電話, 推銷電話, 最煩的來電, 電話騙案, 騷擾電話 on Friday February 8th, 2013 by h.hsieh. 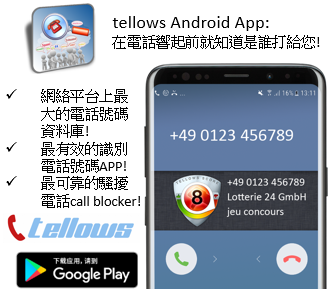 This entry was posted in 本週最烦人的三通来电 and tagged Tellows来电统计, 骗子电话, 骚扰电话 on Friday February 8th, 2013 by h.hsieh. This entry was posted in Tellows 骗子电话新讯(中国) and tagged Tellows 骗子电话新讯, 骗子电话 on Monday January 28th, 2013 by h.hsieh. This entry was posted in 本週最烦人的三通来电 and tagged Tellows来电统计, 广告电话, 骗子电话, 骚扰电话 on Thursday January 24th, 2013 by h.hsieh. This entry was posted in 本週最煩人的三通來電 and tagged Tellows來電統計, 廣告電話, 推銷電話, 最煩的來電, 電話騙案, 騷擾電話 on Thursday January 24th, 2013 by h.hsieh.